President Donald Trump signs an executive order to keep families together at the border, but says that the 'zero-tolerance' prosecution policy will continue, during an event in the Oval Office of the White House in Washington. In what is being viewed as the most significant policy reversal of his 17-month administration, President Donald Trump on Wednesday signed an executive order ending the policy of separating migrant children from their parents who illegally crossed the southern border with Mexico into the U.S.
"It's about keeping families together while at the same time making sure that we have a very powerful, very strong border," Trump said as he signed the document just prior to departing the White House for a political rally in the state of Minnesota. “The border is going to be just as tough as it’s been” despite the executive order, he said. The president's policy retreat follows a withering attack by Republican and Democratic officials who alike termed the family separations as inhumane. The actions left parents with little or no information about where their children were being taken or when or how they would be reunited. Trump's executive order went into effect immediately when he signed it, according to Gene Hamilton, counselor to U.S. Attorney General Jeff Sessions. However, he added, there will be an "implementation phase that follows." "Right now, we have the lawful authority to detain a family unit together for up to 20 days," Hamilton told reporters on a conference call following the signing of the order. But for extended detentions to keep families together beyond that time frame it is "critically important" for Judge Dolly Gee of the U.S. District Court of Central California to make a ruling, according to Hamilton. Under the order, the Homeland Security secretary will, with some exceptions, maintain custody of alien families while any legal proceedings concerning illegal entry or immigration status involving their members are pending implementation. It also instructs the Defense Department to provide or construct facilities to house the families. The Justice Department is ordered, "to the extent practicable," to "prioritize the adjudication of cases involving detained families." The president took the action, sitting at the Resolute desk in the Oval Office with Vice President Mike Pence on his left side and Department of Homeland Security Secretary Kirstjen Nielsen to his right. The president emphasized that his administration's overall "zero-tolerance" policy on illegal immigration is not ending. For days, Trump and key officials in his administration had contended that he could not act unilaterally to overturn the policy and that only Congress, through legislation, could ban the breakup of families. FILE - First lady Melania Trump listens as she meets with personnel at Cincinnati Children's Hospital Medical Center, in Cincinnati, Feb. 5, 2018. The U.S. in the last six weeks has separated more than 2,300 young children from their parents and sent them to detention centers, while charging their parents with illegally entering the country. Business and religious leaders, four former U.S. first ladies and Trump's wife also voiced sharp criticism of the policy to split up migrant families, many of them escaping poverty and turmoil in Central America, as they illegally crossed the U.S. border. The executive order is likely to quell some, but not all, of the criticism. "An eleventh-hour executive order doesn't fix the harm done to thousands of children and their parents," said a statement from the American Civil Liberties Union. "Trump's order replaces one crisis for another: Children don't belong in jail at all, even with their parents, under any circumstances." 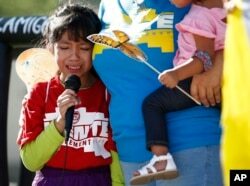 Akemi Vargas, 8, cries as she talks about being separated from her father during a family separation protest in Phoenix, Arizona, June 18, 2018. Trump, earlier Wednesday, told a group of lawmakers at the White House that the images of sobbing and frightened young children being taken away from their parent by U.S. authorities "affect everybody." The president added he was torn by the issue. "We want the heart," he said, "but we also want strong borders and we want no crime." Trump also renewed his attacks on the media and opposition Democrats for the way they were portraying his administration's policy. The U.S. leader contended that the mainstream U.S. news outlets are "not mentioning the safety and security of our Country when talking about illegal immigration." He claimed that U.S. immigration laws "are the weakest and worst anywhere in the world" and that Democrats "will do anything not to change them." "It's the Democrats fault, they won't give us the votes needed to pass good immigration legislation," Trump said, ignoring that Republicans control both chambers of Congress. "They want open borders, which breeds horrible crime. Republicans want security. But I am working on something — it never ends!" Trump's latest broadside against two of his favorite targets came hours after he met with fellow Republicans in the House of Representatives, voicing support for a pair of immigration measures the chamber plans to vote on Thursday to overhaul U.S. immigration policies and curb the separation of children from their parents at U.S.-Mexican border. 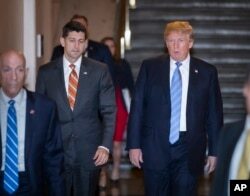 Speaker of the House Paul Ryan, R-Wis., left, walks with President Donald Trump as they head to a meeting of House Republicans to discuss a GOP immigration bill at the Capitol in Washington, June 19, 2018. "We can enforce our immigration laws without breaking families apart," House Speaker Paul Ryan, the leader of the Republican majority in the chamber, said before Trump announced he would sign an executive order to end breaking up families. It is not clear, however, if either piece of House legislation has enough support to win passage. Despite signing the executive order, the Trump administration is maintaining its call for Congress to adopt more comprehensive immigration reforms and approve $25 billion in funding for construction of a wall along the U.S.-Mexican border. "We'll get the wall done," Trump said after signing the order, in response to a question about funding for the wall. 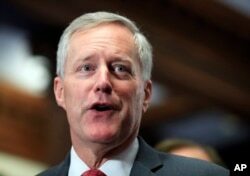 FILE - Freedom Caucus Chairman Rep. Mark Meadows, R-S.C., speaks to reporters on Capitol Hill in Washington. Republican Congressman Mark Meadows said Trump told the lawmakers they need to get something done on immigration "right away." Senate Majority Leader Mitch McConnell said Tuesday all 51 Republican senators in the 100-member Senate "support a plan that keeps families together," adding he intends to ask Democrats to support the measure. The Associated Press reported Tuesday the Trump administration has been sending babies and other young children separated from their parents at the border to at least three "tender age" shelters in South Texas, and that the government plans to open another shelter to house hundreds of young migrants in Houston. Lawyers and medical providers who have visited the shelters described play rooms with crying preschool-age children in crisis, according to AP. Ken Bredemeier and Chris Hannas contributed to this report.